Gentle Friends, it's been a wonderfully rainy winter so far, and with all the cold and damp I had a hankering for some soup. 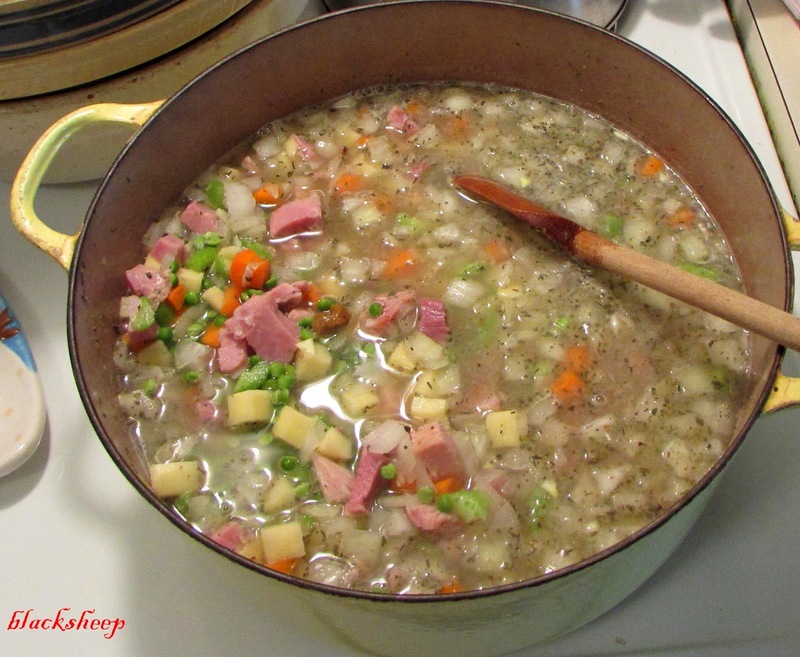 I had baked a gigantic ham-a-saurus and even after giving away a ton of ham to Friends I was still left with quite a lot...I did some thinking and came up with "Split Pea" soup. The Internet yielded a nice and easy recipe...from Taste of Home - "Hearty Split Pea Soup." .... after a few simmering hours ... here's a snap of an overloaded bowl of this wonderful soup. It is supposed to be rainy off and on for the next 10 or so days, and this recipe made quite a lot so we'll be having soup again soon!! That's about it for today sports fans, thanks for stopping by, stay warm and dry!! Always good to have a bowl of soup at this time of year! One word. YUM!!!!!!!!!! It looks delicious and I love some good homemade soup on a cold winter day! 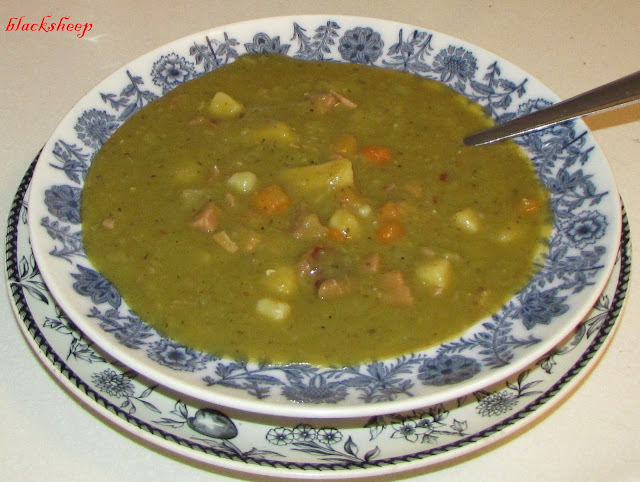 Split pea soup always reminds me of the George and Martha book I used to read to my children. Martha loved to make split pea soup but George hated split pea soup. He did not want to hurt Martha's feelings so he pretended he ate the soup but he poured it in his shoes. Which worked until it was time to put them on!! Your split pea soup looks yummy. Homemade soups are always the best and yours looks delicious. I love soup. Just made a huge pot of vegetable beef soup so like ya'll we will be having it again soon. This is definitely soup weather!! I made some good chili yesterday! Very rainy and cool up here. However, after last summer, we all need the water. I loved your Ham asarous! That made me laugh, the soup looks delicious! My favorite magazine is "Taste of Home." made the soup for dinner tonight - it was delish - thank you for the post!